He is the Wichita State University career assists leader and now plays professional basketball for the Toronto Raptors. Fred VanVleet returns to Wichita to host a basketball camps for area youth and to make a public appearance for Shocker fans. The camps will provide those attending with the necessary skills to improve their game. Kids will learn basic ball-handling, shooting, passing, rebounding and defensive skills as well as advanced crossovers and finishes. Along with the fundamentals, VanVleet says the basis of camp is for students to appreciate basketball. The camps are designed for children at all levels of skill to come together to work on the basics and hone their craft on the court while learning to follow their dreams, whether it be to make the team at school or play in the big leagues. 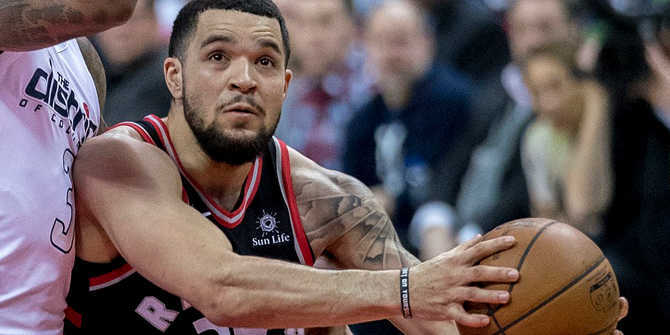 Fred VanVleet’s basketball camps will be held July 21 at the Farha Sports Complex on South Meridian and July 22 at the Andover YMCA. Registration is now open for kids aged 7-18. Students can enroll for $100. Camp goers will also get lunch, a camp T-shirt and a photo with VanVleet. The excitement goes beyond that of the kids at camp, VanVleet will also be making a public appearance at a pop-up shop where he will sell exclusive merchandise from his FVV clothing line. Repped by his Toronto Raptor teammates, Kyle Lowry and Pascal Siakam, VanVleet’s clothing line is growing in popularity. He even recently opened up a retail store in his hometown of Rockford, IL. Catch VanVleet in-person for photos and a meet-and-greet during the pop-up shop from 6-9 p.m. on July 21 at The Waterfront. You can learn more about the college team that jumpstarted VanVleet’s career here.